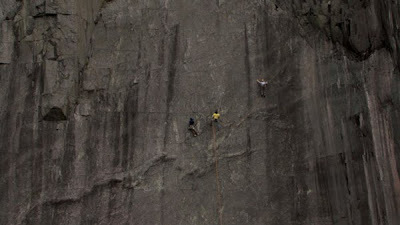 The second film on the DVD is a profile of someone who must be one of the world’s most psyched climbers, Kevin Shields. 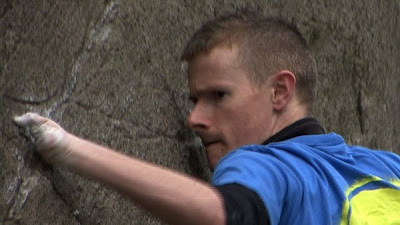 All top climbers talk about calculated risk, but Kev pushes the margins of his ‘calculations’ closer to real limits than any other climber I’ve ever seen. It can be terrifying to watch. Even the detachment from the action that comes from being behind the camera does not offer any protection from that terror. I’ve been filming Kev since early 2006. Some of the footage I shot then was used in Committed Vol I, but the rest of it has gone unseen until now. This year I’ve filmed Kev both in the Peak District and the Highlands and, without wishing to give away too much of the story, have captured some really special moments, from ecstasy to extreme tension. Even during the editing process, watching short clips back has left my palms damp…and I already know what happens! For me good films are all about emotion. For a film to be great it has to make you laugh and make you cry. Films that do both stick with you. One emotion that you should experience when watching Single-Handed is frustration. This was highlighted when I was adding subtitles as an option to the DVD. 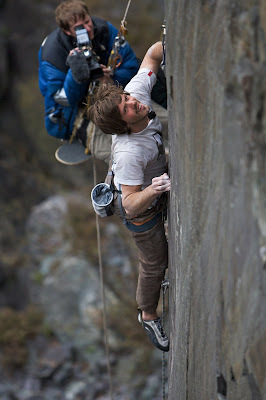 In this scene Kev is struggling with the crux move on an E7. 00:14:31:23,00:14:33:17, That's just never possible. 00:15:02:02,00:15:03:15, Nah, it's just never gonnae work, Gaz. 00:15:04:15,00:15:05:15, Lower us down now. "Warning contains some effing and blinding"
‘Single-Handed’ has a light score in terms of music. We recorded some good location sound from the radio mic Kev was wearing, so I wanted to make maximum use of that in the mix. 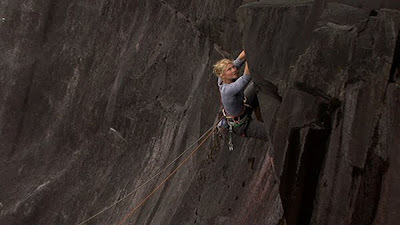 You may have noticed in other films that the breathing of a scared climber can add much more tension than any music, so most of this film uses an atmospheric soundscape rather than a musical score. The one track I have used is by the singer/songwriter Francis Hayes and is called “Friday, Saturday, Sunday”. I had this track on an old CD that was recorded live in a pub in Stirling. I really liked the track, but the recording quality was quite poor. Since this was the only version of the song ever recorded I managed to persuade Francis to re-record this track especially for the film. This allowed us to adjust the length of the intro to match the opening sequence. Francis and I spent some time in Chris Hall’s home recording studio to get the piece just right for the film. Chris added some bass guitar to Francis’ original acoustic and worked his sound engineer’s magic to complete the track. This short clip from the film shows Kev enjoying the wonderful line of ‘Traveller in Time” at Ramshaw Rocks in Staffordshire. 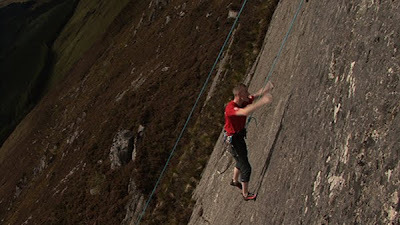 The World Premier of Single-Handed will take place on Sunday 18th October at 7pm at the Edinburgh Mountain Film Festival in the George Square Theatre. Kev will be there to answer a few questions after the film. I’m really excited about seeing the audience’s reaction to this film. I may not manage to make everyone laugh and cry, but I'm sure its a film that will generate some emotion and leave your palms damp. In this series of four posts I want to give you some background and a sneak preview of each of the four films on Hot Aches Productions’ new DVD ‘Monkey See, Monkey Do’ or ‘MSMD’ as the kids call it. 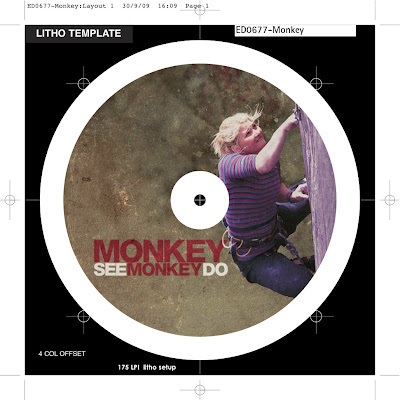 Hazel Findlay on the MSMD disc artwork. Photo by Adrian Trendall, design by Ifan Bates. I was very fortunate to get this footage, it wasn’t exactly a planned shoot. 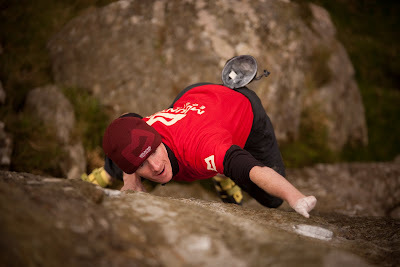 Matt Segal was on a four-week climbing trip to the UK and although I had planned to catch up with him, we had no plans to shoot anything on the slate. I met him a week into his trip in the Vaynol Arms in Nant Peris. 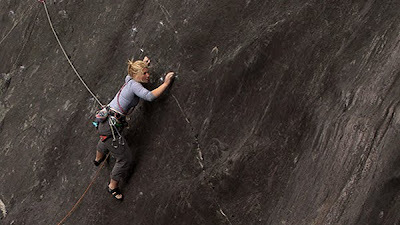 Also in the bar that night was the young British climber, Hazel Findlay. 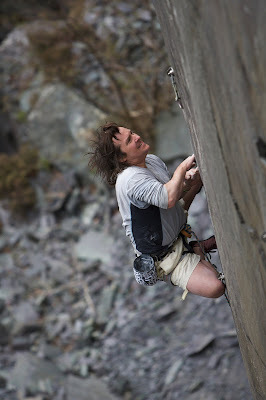 After a lengthy debate on conditions and weather, we made plans to spend a couple of days climbing in the slate quarries of Llanberis. The next day while Matt and Hazel were attempting the esoteric slate classic Gin Palace, who should turn up but Johnny Dawes, nicely completing the line up for the film. What followed was six hours of them taking it in turn to besiege this crazy route. You’ll have to watch the film to find out which of them makes it to the top. 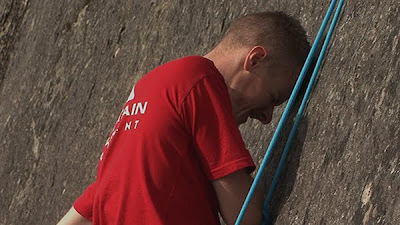 I think one of the things which makes this film interesting is the contrast between the climbers: A professional sponsored athlete from the US, a young student from England, fairly new to the scene, and the British rock master. Very early on in the edit stage I commissioned my friend and regular collaborator Chris Hall to compose the music for the film. I asked him to write a theme for each climber, based on their personality. Later, these themes were arranged to make the score for the film. I wanted to be able to tell who was climbing just by listening to the music. Chris then scored the music to match the climbing action. 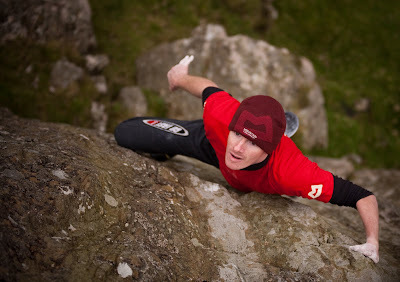 Since Chris is a climber himself he’s able to appreciate the situations that the climbers face, dilemmas over whether to move a left hand or a right foot first, that tentative feeling which comes with a sketchy foot or a razor sharp crimp. He also included several subtle musical cues which follow the action on screen, for example as Hazel’s foot slips there’s a ‘twang’ of a guitar string.